Marion Zimmer Bradley Literary Works Trust, 9781938185502, 288pp. "The combination of love and blades is a match to be enjoyed in many highly diverse ways." - SF Revue A decade ago, readers thrilled to the debut of a new series of elegant, romantic fantasy stories. 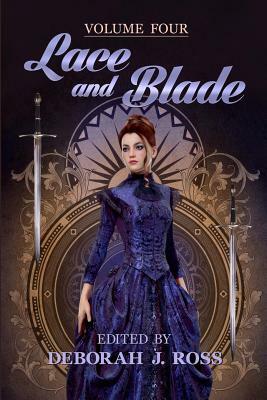 Best-selling author Jacqueline Carey hailed the first Lace and Blade as "a banquet of adventure, intrigue, and romance." Publisher's Weekly wrote, "Readers will be left starry-eyed and hoping for the series to continue." Now those hopes are fulfilled in this new volume, brimming with tales that enchant and delight. Here are stories of love and betrayal, of alchemy and swordplay, of lovers lost and found, of dreams denied and fulfilled -- from the secret heirs of Alexander the Great to a bard who sings traumatized dragons back to sanity to an African girls' cricket team to an American patriot on the eve of the Revolutionary War, from the rooftops of Victorian Paris to 17th Century India to imaginary but no less vivid lands and characters who will whisper to you of sweet, sweet dreams long after the final page is turned. This volume includes stories by Robin Wayne Bailey, Carol Berg, Marie Brennan, Doranna Durgin, India Edghill, Rosemary Edghill, Heather Rose Jones, Pat MacEwen, Diana L. Paxson, Marella Sands, Dave Smeds, Judith Tarr, and Lawrence Watt-Evans.